More Experience will be Shared soon...!!! If you like SimpleWay2Code and would like to contribute, you can also write an article and mail your article to simpleway2code@outlook.com. 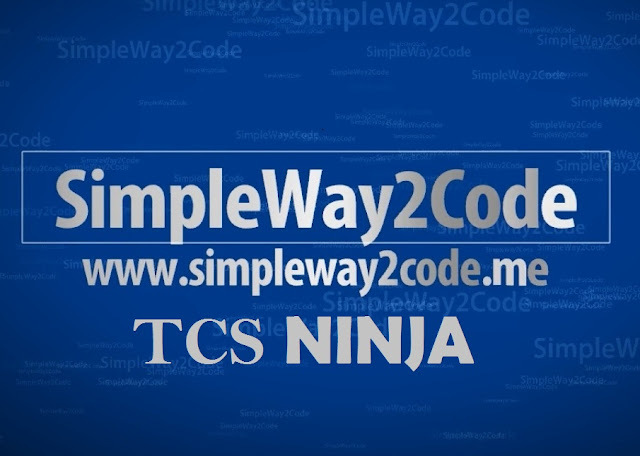 See your article appearing on the SimpleWay2Code main page and help others. Could anyone tell me about the pattern for TCS off campus on 31st jan,2018. plz..... We will give that extra 2 rounds (mcq and coding)or not ??? The Off Campus test for 2017 batch does not contain Coding Section. For Off Campus test, there will be 3 sections: Quantitative Aptitude , Programming Language Concepts Consisting of Multiple Choice Questions and a Verbal Ability Test. Then please tell the new pattern . How many no of questions will be asked along with the marking scheme and time duration for each sections ? Till Now it hasn't been disclosed but I think TCS will Inform you about the test pattern for Off Campus soon. Hey..!! I am from 2017 batch and I have applied for TCS off campus drive that is going to be held on 31st Jan'17. I just wanted to know that what is the written test pattern for off campus drive? There will be coding section or not ?? The Off Campus test for 2017 batch does not contain any Coding Section. For Off Campus test, there will be 3 sections: Quantitative Aptitude , Programming Language Concepts Consisting of Multiple Choice Questions and a Verbal Ability Test. Can you please suggest me the best websites to crack the TCS QUANT section and PROGRAMMING MCQS section for the off campus drive to be held on jan 31st,2018? if coding test is not included, how the test time is 90 minute ?? total 70 minute . how 90 ?? I cleared written test. some tips to clear tr and hr. Go through your CV and prepare for the technical subjects and topics that you have mentioned in your CV and for HR, I have posted some questions, you can prepare those questions, but they may ask you anything in HR. how to prepare for Tcs entry level hiring 2019/pg graduates?